Are your floors looking a little worn down? There’s no better time than right now to get them refinished by Fabulous Floors! Find out why the best hardwood floor refinishing Ellicott City has to offer is right here at Fabulous Floors. Restore the beauty and shine back to your hardwood floors without having to replace them completely. Our highly skilled technicians have all the knowledge and abilities to refinish your hardwood floors in Ellicott City and transform them! We have mastered the art of delivering the best hardwood floor refinishing Ellicott City MD has to offer. At fabulous floors, we strive for excellence in all that we do. In just 1-2 short days, we can restore your hardwood floors to what they once looked like. The best part? Our incredible hardwood floor refinishing service is safe for your home, family, and the environment. The GREENGUARD certification shows that all of our products and services have passed strict health and environmental standards to make our process as clean as possible. Through several years of experience in the hardwood floor renewal industry, we have developed a simple, yet effective refinishing process. Step 1: The first thing we do is remove any carpet that may be left over. 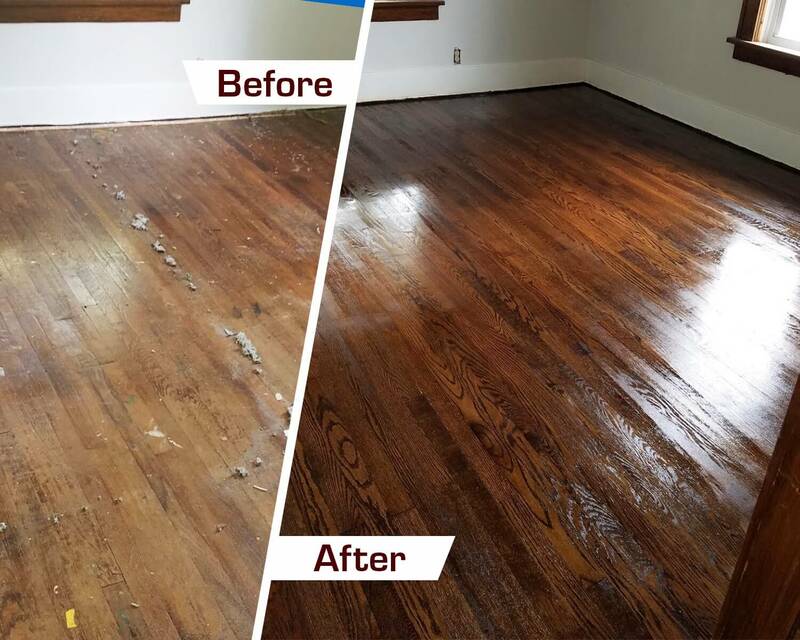 Any left behind residue is removed with an expertly designed solution in order to not damage the hardwood floors in any way during the process. Step 2: Then, we sand your floors with our incredibly effective process that is also virtually dust-free. The majority of scratches and dents on your hardwood floor will disappear. Our technicians don’t forget hard to reach spots either. Step 3: After the sanding is complete, we apply an even coat of your choice of stain color. Did you know we have over 25 color options to choose from? You can to try and match your current decor, or add a brand new look to your home. Step 4: Finally once the stain is dry, we apply 2-3 coats of our long-lasting polyurethane finish to your hardwood floors. This helps to protect your hardwood floors against future damage and keeps them looking beautiful for the years to come.